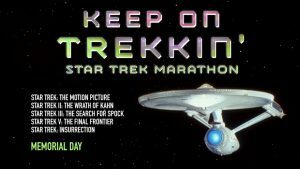 HDNET MOVIES celebrates Star Trek’s 50th anniversary this year with the “Keep On Trekkin’” Memorial Day Marathon beginning Monday, May 30, at 10aE, as William Shatner takes control of the Enterprise to stop an alien force from destroying Earth in STAR TREK: THE MOTION PICTURE, with Leonard Nimoy and George Takei. The journey continues as the Enterprise crew goes toe-to-toe with a cunning nemesis in STAR TREK II: THE WRATH OF KHAN, with Ricardo Montalban, at 12:20pE, and risk their lives to bring an old friend home in STAR TREK III: THE SEARCH FOR SPOCK, at 2:20pE. Then, Spock’s sinister sibling sends the crew on a quest for God in STAR TREK V: THE FINAL FRONTIER at 4:15pE. And Patrick Stewart uncovers a Federation conspiracy in STAR TREK: INSURRECTION, with Jonathan Frakes, at 6:10pE. The marathon encores at 8pE.